Located in Belgium, Europe. 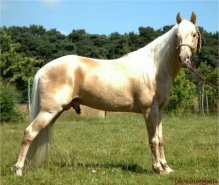 Potter is the only champagne Tennessee Walking Horse stallion in Europe and also the only son sired by the late The Pride Piper on this continent. 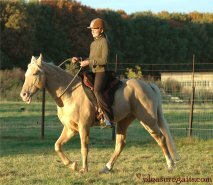 This horse truly has it all; walking gaits, conformation, disposition and a shiny golden champagne coat as a bonus. Potter always has 1 mare by his side all year around. He shares a pasture, paddock and stall with her. You would never know he is a stallion. Potter is a very gentle and easy going horse with lots of talent. Together we've given many demonstrations to promote the breed in Belgium. 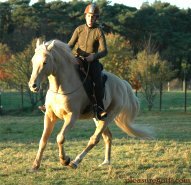 This horse has lots of stamina and would do very well in long distance riding. Overall Potter is a joy to ride and a very smooth horse. Registered TWHBEA, PSHR, CHBOA and ICHR. His offspring is spread accros Europe; Belgium, France, Germany and the Netherlands. Potter is available for all gaited breeds. Handbreeding only. Pride's Black Shadow Pride Of Midnight H.F.
Jester's Fanfare Midnight Jester E.